August 1988, Spacemen 3 embark on one of the strangest events in the band’s already strange history. Billed as “An Evening Of Contemporary Sitar Music” (although consciously omitting the sitar), the group would play in the foyer of Watermans Arts Centre in Brentford, Middlesex to a largely unsuspecting and unsympathetic audience waiting to take their seats for Wim Wenders’ film Wings Of Desire. Spacemen 3’s proceeding set, forty-five minutes of repetitive drone-like guitar riffs, could be seen as the “Sweet Sister Ray” of ‘80s Britain. Their signature sound is at once recognizable and disorienting —pointing as much to the hypnotic minimalism of La Monte Young as to a future shoegaze constituency. 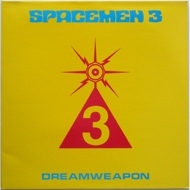 On this double LP reissue, Dreamweapon is augmented by studio sessions and rehearsal tapes from 1987 that would lead up to the recording of Spacemen 3’s classic Playing With Fire album. “Spacemen Jam,” featuring Sonic Boom and Jason Pierce on dual guitar, is a side-long mediation on delicate textures and psychedelic effects.